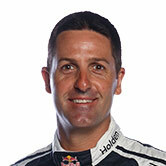 Six-time Champion Jamie Whincup has become only the second Supercars driver to reach 100 race wins with today’s victory at Sydney Motorsport Park. Whincup denied teammate Craig Lowndes a fairytale win in his 600th race to join the Supercars veteran as the only drivers with triple figure wins in the sport. Lowndes has 105 wins. Whincup started from third on the grid for the 200km race and got the better of Lowndes in the second round of pit stops to finish 2.58sec ahead of the TeamVortex Commodore. The Red Bull racer’s 99th win came up at Townsville in July and after being pipped by teammate Shane van Gisbergen, he got the job done today and continues to lead this year’s championship points by 137. “What an honour to join Lowndesy on the ton,” he said. 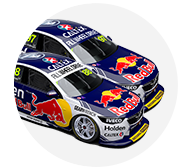 Having won six championships and four Bathurst 1000s, Whincup joins Lowndes in the triple figures in his 13th full season in the category. The 33-year old debuted in the category in 2002 at the same circuit, with Garry Rogers Motorsport and has raced with Triple Eight since 2006, winning his first Clipsal 500 with the team. Since then, he’s finished on the podium for 40 per cent of all the races contested. Lowndes got an incredible start in today’s race, passing pole man Chaz Mostert around the outside at turn one and holding station until the cycle of pit stops. Mostert joined the Triple Eight cars on the podium, while yesterday’s winner Shane van Gisbergen finished fifth after a late tap from James Moffat. Moffat was immediately issued a drive through penalty, eliminating his top five hopes. Defending champ Mark Winterbottom struggled through after an early tyre drama to finish 14th. The Supercars return at Sandown for the start of the Pirtek Enduro Cup from September 16-18.